Petition to Rehire Christine Nelson NOW! 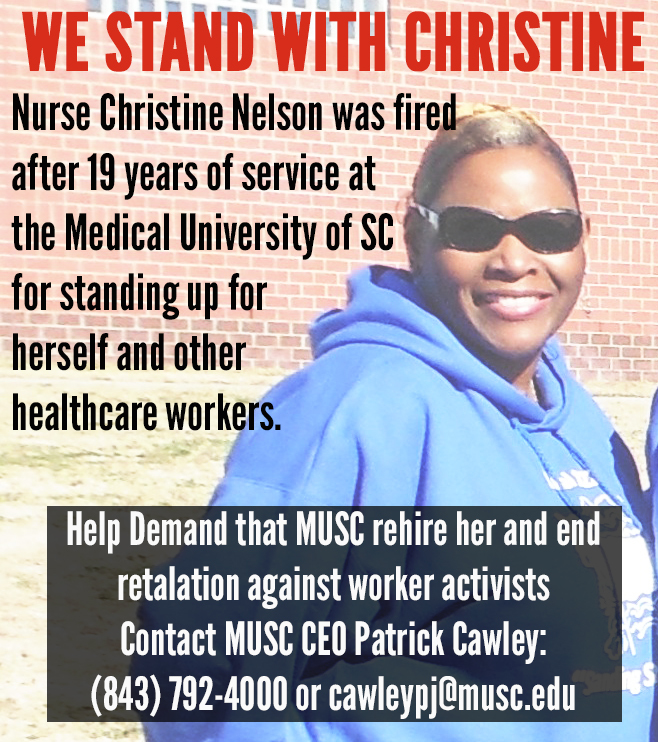 Tell Medical University of South Carolina CEO Dr. Patrick Cawley, MUSC CFO Lisa Montgomery, South Carolina Governor Nikki Haley, U.S. Representative Jim Clyburn, U.S. Secretary of Labor Thomas E. Perez and President Obama to reinstate Nurse Christine Nelson NOW!! Fill in the form below to send a message to Medical University of South Carolina CEO Dr. Patrick Cawley, MUSC CFO Lisa Montgomery, South Carolina Governor Nikki Haley, U.S. Representative Jim Clyburn, U.S. Secretary of Labor Thomas E. Perez and President. Obama to reinstate Nurse Christine Nelson NOW and end retaliation against worker activists! (scroll down below the form to see the text). 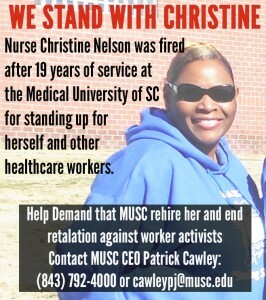 I am writing to demand that you reinstate Christine Nelson to her position at the Medical University of South Carolina. A native of Charleston, Chris has been a registered nurse for 19 years at MUSC and has a distinguished record of service. She was fired after she requested neutral representation in a meeting with supervisors. Over the past two years, Nelson has reported to coworkers, local church and community leaders, and to the Charleston-area members of the state legislature that she and many of her coworkers feel unsafe at work. These concerns have led her to speak publicly against racial discrimination in the hospital, abuses of the Family Medical Leave Act and HIPAA (federal privacy law) violations by supervisors, as well as the hospital’s mistreatment of low wage workers. I believe that her dismissal was a retaliatory action. I also believe that disrespect for any workers – RN’s, CNA’s, MOA’s, housekeepers, and all hospital workers – is disrespect to patients and harms the quality of care. MUSC faces many institutional challenges in the months ahead, including the proposed merger with the College of Charleston, the effort to secure magnet status, the planned campus expansion, and the maintaining of adequate levels of state funding. Each of these will require you to solicit public input and broad support. Chris Nelson’s reinstatement will go a long way toward indicating to her many supporters that the hospital is willing to listen to the community’s concerns and that it values employees who stand up for patients and for one another. I urge you to reconsider this decision.